Hey Baltimore: Come Adopt A Pet! Federal Hill Ace is hosting Adopt-A-Pet Day on Saturday 4/30/11 from 12-2pm. Recycled Love Rescue will be here with a pup or two and tons of info on the adoption process. Recycled Love rescues animals from abuse, injury, neglect and abandonment. If you can’t adopt, the organization has both fostering and sponsoring programs for their dog and cats. BUT if you adopt one of their animals before 5.31.11, we’ll give you 30% off your first purchase of pet supplies. Right. On. PSA: Cute little kitties need a home. Meet Oreo and Daisy. They are cute and like to play. 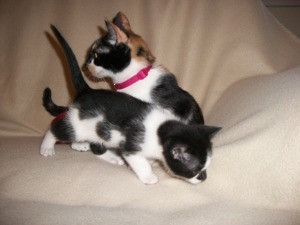 Looking to adopt two of the cutest felines in the entire world? You must meet Oreo and Daisy. More animal adoption possibilities in June at 5th Street Ace’s pet adoption day and in Baltimore on July 17 (Federal Hill Ace) and 24 (Waverly Ace).